In the eights race, the Victorians led from the start and were never troubled by the other crews. A comfortable 1 3/4 length margin was achieved at the finish. The more interesting stories took place before the race. Tasmania flew to the Championships rather than travelling by ship or train—a first for interstate championships. Victoria travelled by air for the first time in the next year to Perth. 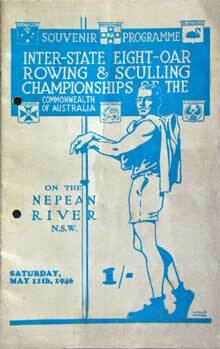 The Victorian crew included Ken Grant who went onto being a great leader of Western Australian rowing. The cox of the Victorian crew weighed on 5.5 stone and had to carry almost half his weight in additional weight. WA refused to endorse the selection of 64 year old George Rogers as stroke of their eight. Rogers was also one of the selectors. Nobby Vale from the NSW left for America after this race and was lost to the sport in Australia. In the sculling race a poisoned leg and heel prevented the Victorian sculler competing. It was therefore a row over to Wood.